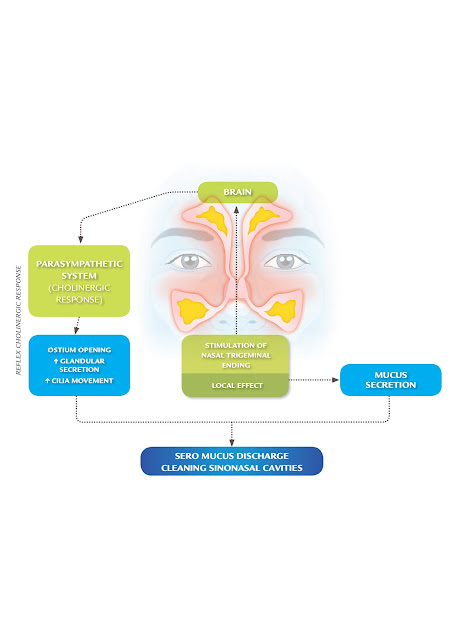 Nasodren acts activating the physiological defense (natural) mechanisms of the upper airways (increased mucus secretion, greater ciliary cleansing activity and increased arterial blood flow) that are impaired during rhinosinusitis. Nasodren stimulates the trigeminal nerve endings of the nasal mucosa, which leads to a seromucus discharge, reduction of the inflammation of the mucosa and opening of the ostiums (the passages that communicate the sinuses to the nasal cavity), and therefore cleaning sinuses and nasal cavity. This specific mechanism of action can produce some itching, sneezing, a brief sensation of mild to moderate burning sensation in the nasopharynx and more rarely, a brief lacrimation and flushing of the face. These are manifestations that Nasodren is working properly. All these effects usually diminish during the course of treatment. 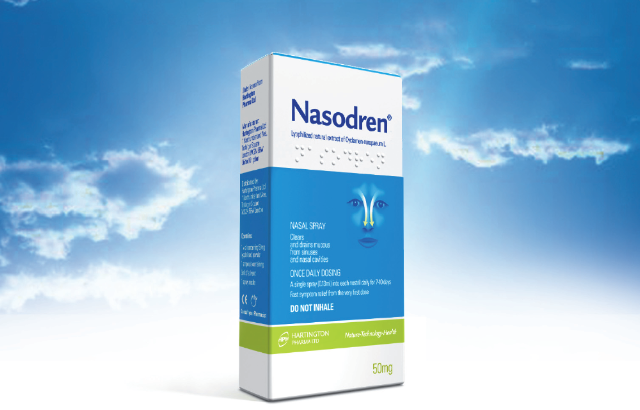 Nasodren is a product indicated for the symptomatic treatment of acute and exacerbations (flare ups) of chronic rhinosinusitis. Its main component are saponins, from a cyclamen extract that gives a fast relief from rhinosinusitis symptoms, like nasal blockage, obstruction, congestion or nasal discharge. Nasodren is a very safe product since its component, saponins, is not absorbed and consequently do not reach bloodstream and don’t produce systemic side effects, i.e. do not affect the liver, the kidneys or other organs and does not affect the nasal mucosa integrity.